All referrals from doctors are welcome and we also accept self referrals (where you haven’t yet seen a doctor). In addition to this, we accept and manage cases for Workcover, DVA, CTP and private health insurance. We have HICAPS available for patients who have occupational therapy cover included in their private health insurance. One of the real benefits of seeing a hand therapist early is, that they can jump start your recovery by commencing your rehabilitation within a week of your injury, with approval from your treating doctor. We run to our appointment schedule which means that you will not spend hours in our waiting room waiting to be seen. We want to be part of your team to achieve your recovery goals following your hand injury. As a sole-practitioner clinic you are always guaranteed to see the same senior occupational therapist for the duration of your treatment. We are located at Calamvale, which means that you do not need to drive into the city to see us. 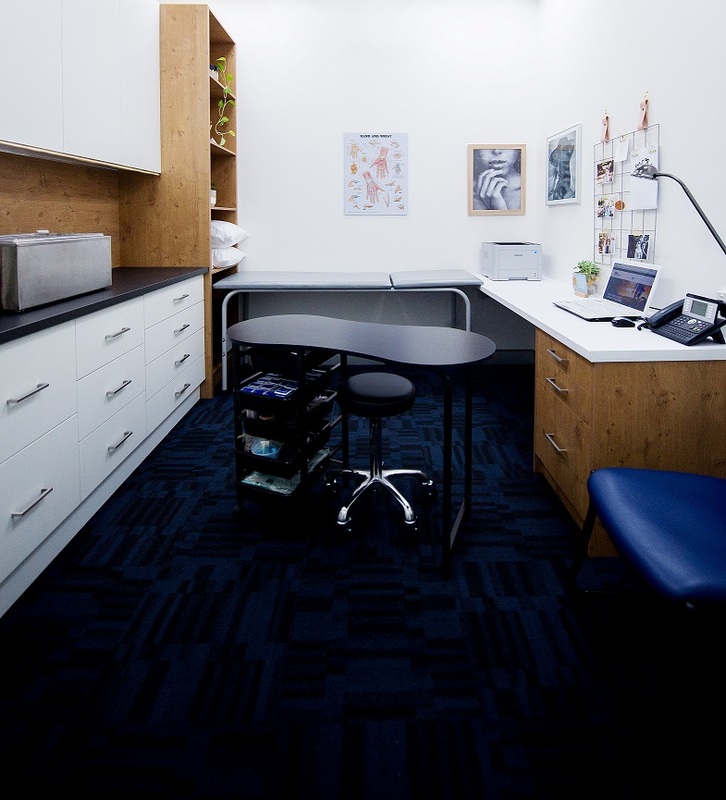 Located within Calamvale Medical Centre, we have access to the latest medical equipment, advice from doctors and a fantastic range of resources at our fingertips. Erika has over 12 years of experience in managing hand injuries and has completed post graduate training to become an Accredited Hand Therapist (as awarded by the Australian Hand Therapy Association). With experience in both public and private clinics across the greater Brisbane area, she understands how to work with people from all walks of life. She completed a Masters degree in 2009 and has been involved in hand therapy research which means that she is dedicated to using the latest research to support her recommendations. We value communication with you and your doctor to make your recovery as smooth as possible. We believe that arming you with knowledge and helping you to set goals you can be in control of your recovery and return to the activities that are important to you as soon as possible. You must discuss driving with your doctor following a hand injury. It is illegal to drive one-handed and driving with a cast, splint or orthoses on your hand or arm may void your insurance, increase your likelihood of an accident, or endanger yourself and others on the road. We can provide advice on safety to drive but your doctor or surgeon is responsible for providing medical clearance to return to safe driving. Our suburban clinic is close to where our clients live and is very close to a bus stop making it more convenient to attend. A doctor’s referral can be helpful but is not necessary to book an appointment. You can choose to refer yourself for hand therapy. The name of your injury or surgery and the date that it occurred (if relevant) will help us to book you an appropriate appointment. At the time of booking, we will also require information regarding any WorkCover claim, Private Health Insurance, or other funding assistance or insurance claims. To make an appointment phone us on 3344 7942 or fill in the contact us form and we will contact you. At your initial appointment we will take a thorough assessment and history of your injury so that we can understand you and your injury. You will be provided education about your condition so that you can be in control of your own recovery. Goal setting is an important part of your recovery and we will help you to set goals which are specific, measurable, attainable, and timely. Your treatment will be tailored to your needs. It may include splints, taping, exercises, wound care, swelling management, massage and use of therapy equipment. Home exercises are an important part of achieving recovery goals, so you will be provided with a home exercise program which is important for you to complete several times each day. Communication with referrers or case managers is an important part of what we offer to ensure we are all on the same team. We are a fee for service practice so please be prepared for payment on the day of your appointment. If your therapist allows you to remove your splint, you can wash your splint in cool soapy water. Take off any straps that can be removed, prior to washing. After washing, dry your splint thoroughly with a towel. Do not leave your splint in your car or any hot environment, as your splint will be effected by exposure heat. Do not attempt to adjust your splint yourself. If you are experiencing any issues associated with rubbing or digging in, please contact your therapist on 0733447942. We offer a complimentary splint adjustment within 3 months.